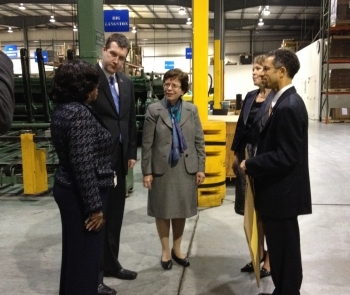 Home › The Commerce Blog › 2012 › February › Acting Deputy Secretary Blank Tours Factory in Flint, Mich.
During her remarks, Blank talked about the good news–the fact that, recently, there has been positive growth in the manufacturing sector. The private sector has recorded 23 consecutive months of job growth, creating 3.7 million jobs. U.S. manufacturers have added 404,000 American jobs in the last two years–the strongest growth since the 1990s. However, she also pointed out that despite the recent positive data, economic growth has not been as fast as anyone would like. The administration realizes how critical a strong and growing manufacturing sector is to long-term and stable economic growth. In Michigan, manufacturing accounts for a massive 90 percent of exports. Even more important, manufacturing is central to America’s advantage as a hub for innovation and advanced research. In fact, two-thirds of our nation’s research and development spending is done in the manufacturing sector. That is why the FY13 budget request includes key new investments in advanced manufacturing to spark private-sector job growth. Specifically, the budget provides $1 billion to create a National Network for Manufacturing Innovation, creating a partnership between government, universities and the private sector. This network will promote the development of breakthrough products and manufacturing technologies, ensuring that the next generation of products are not only invented in the United States, but also manufactured in the United States. Dr. Blank also emphasized the vital role Commerce plays in supporting manufacturing in Michigan. For example, Commerce’s National Institute of Standards and Technology (NIST) Manufacturing Extension Partnership (MEP), through its Michigan Manufacturing Technology Center (MMTC), has been working hand-in-hand with companies statewide to help them grow and thrive. Genesee Packaging is one of the companies to have benefitted from MMTC’s support, having seen a 44 percent increase in cost efficiency since their partnership began. MMTC’s statewide efforts have led to more than 4,300 new or retained jobs since 2009. The business leaders Dr. Blank met with know all too well that manufacturing touches every facet of our national economy: our jobs, our exports, our innovative capacity. Commerce remains committed to keeping a laser-sharp focus on industries like manufacturing to ensure we have a 21st century economy that is built to last.